A sought-after succulent, the yucca, adds a very tropical feel and a distinct look to your garden. It’s a sure head-turner with its long foliage like swords and beautiful fountain-like white flowers terminating on a long trunk from its base. ​Pronounced YUK-ah, it is often misunderstood to be the same as yuca (pronounced YOU-kah), the root crop that is otherwise known as cassava. The yucca’s roots are not edible but if you’re ever in need of natural shampoo/soap source, you’ve found one! More on that later. A quick google search for Yucca may leave you a little confused, though, "Which one?" With over 50 different species, your initial uncertainty is understandable. Let me help you with that: the Soft Leaf Yucca. Instead of long erect swords for leaves, the Soft Leaf Yucca (Yucca recurvifolia) has well, a softer look with its downward curving leaves earning it the names Curved-leaf Yucca, Weeping Yucca, and Pendulous Yucca. It is a more graceful alternative to its stiffer pricklier yucca cousins. In addition to the dramatic look it lends your garden, it’s also characterized by its capacity to grow in most, if not all kinds of conditions – an almost set-and-forget plant. A great option for those who may lack the confidence or time, in caring for plants that require a certain amount of nurturing. For yuccas, the only key principles to remember are plenty of light, water occasionally, and fertilize sparingly. ​1. Soft Leaf Yucca, like its cousins, are a perennial evergreen. They have long lifespans and stay green all year round! 2. They are native to the arid parts of the Caribbean and the Americas. Therefore, they have low water needs and are best placed outdoors with lots of sunlight and minimal shade. Yuccas, in general, are very tolerant of hot or cold temperatures, making them ideal for different climates! 3. Blooms occur in panicles of beautiful white flowers usually during late spring to early summer. 4. Like other yuccas, Soft Leaf Yucca come in differing leaf varieties. Depending on your preference, leaves with yellow strips or those with white stripes can be chosen for an even more eye-catching look. 5. In the cooler evenings, Yuccas produce a pleasing aroma to attract yucca moths, but you'll enjoy this natural perfume too! 6. If you are planting on your own, start with small-sized Soft Leaf Yucca. Larger sized shrubs may need professional installation. 7. Wear garden gloves. Despite its relatively softer leaves, this genus of yucca can still cut skin if handled improperly. 9. After planting, water thoroughly. Despite requiring little water, a newly planted yucca's roots need to be established first. Therefore, watering the plant weekly to every other week will help it become established. 11. It can grow 6-8 feet tall, and the same in width so remember to have enough space to accommodate your yucca. For easy cleaning and pruning, add about 2-3 feet of space around the entire plant. Once established, it requires very little, albeit consistent, watering so make sure to plant on even soil that will not collect water. Take are not to over water. The yucca may be getting too much water if its leaves’ tips turn brown. If underwatered, leaves may turn yellow or brown. Yuccas are usually pest-resistant but in the small chance of an infestation, consider spraying the plant with a dishwashing solution diluted with water. Don’t let those soft-leaves fool you. Always use gloves when maintaining your yuccas! Soft Leaf Yuccas require little maintenance. When the older leaves start to brown, cut them off with garden shears. This allows for a much nicer-looking plant and leaves room for more leaves to grow! Yuccas grow slow, so they will need fertilizer only a few times a year. 17. Dubbed “Lamparas de Dios” or Lamps of God by early American settlers. Yuccas produce a tower of wonderful white or whitish flowers in drooping panicles. 18. Yuccas bloom once a year so pruning spent flowers will not necessarily encourage further blooms. They age quite gracefully so there shouldn’t be a need to remove or prune them. 19. Yucca plants reproduce through its symbiotic relationship with the appropriately named yucca moth. These moths pollinate the plant so remember to allow them "full-access" to your yucca! When your indoor yucca gets too tall, you will need to prune it to both keep its size and propagate the plant. Gently remove the yucca from its pot. Using a saw, cut no shorter than midway from the root to the tip of the plant. You may use the top half of your yucca to start a new plant! Simply cut away the leaves and plant the trunk on the end where it was sawed. 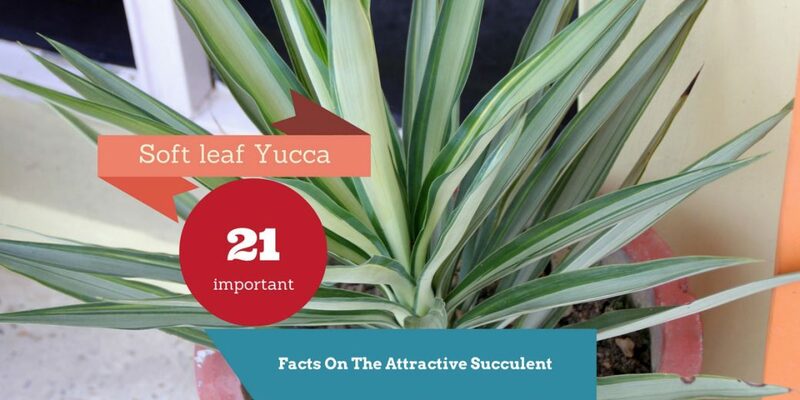 There you go, the 21 things you need to know about Soft Leaf Yucca. If cared for properly, your Soft Leaf Yucca will give you many years of beauty with little effort! Native Americans, on the other hand, used yucca fiber to make ropes and cords that were then used baskets, ladders, belts and so on! And yes, you can make soap or shampoo out of the roots of several yucca species! Yucca flowers are edible! The Colorado State University Extension describes its taste as “slightly bitter, with a hint of artichoke…”. They were consumed raw or slightly sautéed. The Yucca Plant, Yucca Filamentosa, and the Yucca Moth, Tegeticula (Pronuba) Yuccasella Riley: An Ecological-Behavior Study. Rau, Phil. (1945) Annals of the Missouri Botanical Garden, vol. 32, no. 4, 1945, pp. 373–394. A subfamilial classification for the expanded asparagalean families Amaryllidaceae, Asparagaceae, and Xanthorrhoeaceae.